Teachers already know that vocabulary development is a critical part of a child's development, but I've often talked with colleagues about how hard it is to fit it in to our daily schedules. "Where does it all fit in?" is a question that elementary teachers find ourselves asking all the time. When we start to think about the many components that need to be squeezed into our days, we can get overwhelmed and sometimes vocabulary gets lost in the shuffle. However, vocabulary doesn't need to be an overwhelming part of your instruction! There are opportunities for practice everywhere! Vocabulary is in the books your students are reading, the math lessons you are teaching, the science experiments you are performing and more. There are lots of ways to engage students in meaningful practice that can easily become a part of your daily instruction in any subject. 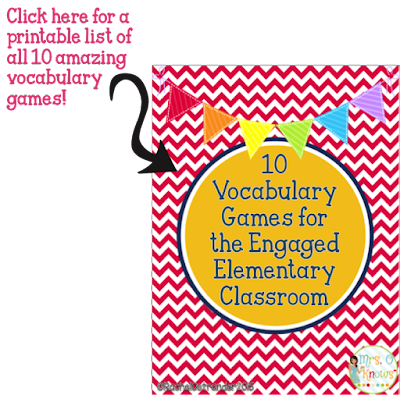 Today I'm sharing 10 vocabulary games that are student and teacher approved! Draw a line down the middle of your whiteboard/chalkboard. Write 10-15 vocabulary words in different spots in each space, making sure that you put the same words on each side. I would recommend not putting them in the same place on each side. 1. Divide your students into two teams and have each line up on one side of the board. 2. One student from each team comes up to the board and grabs a fly swatter. 3. The teacher reads the definition of the word. After the teacher is finished reading the entire definition, students swat the correct word. The first student to correctly swat a word gets a point for their team. Each student passes the swatter to the next person in line and they go to the end of the line. 4. Continue until all words have been covered at least once. I like to cover all of the words more than once, but you can definitely adjust this depending on the time that you have. You will need to create a sentence for each vocabulary word and then replace the vocabulary word with a nonsense word. Write each sentence on a sentence strip then write each vocabulary word on a separate sentence strip piece. You will need to make a set for each group that you will have. As an alternative, you can type the sentences and words instead (with sentences on one page and words on the other), though this would be a bit less interactive. 1. Put students in groups of 2-4. 2. Give each group the sentences and then a baggie with the words. If typed, give students the page with the sentences and the page with the words. 3. Students should match up their nonsense sentences with the correct vocabulary words. You can make this a timed activity for a little extra competition. Groups should inform the teacher as they complete the activity to have their answers checked. Write each vocabulary word on a separate sticky note. 1. Have students stand in a circle. 2. Choose one student to be "it" and have that student stand in the middle of the circle. 3. Put a sticky note with the vocabulary word on the students back and have them slowly turn around to show the other students what their word is. 4. Instruct the students in the circle to come up with hints that they can give the student with the note on their back. Be clear in directing your students to NOT use the word itself in their clue. As an extra incentive, if their clue leads to a correct guess, they will become become the person who is it. 5. Let the student guess after each clue or let them collect clues and then guess after a certain amount. When they have guessed correctly, or the other students are out of clues, choose a new student to be "it" and begin a new word. Write a sentence for each vocabulary word on a sentence strip. Cut the sentence apart, phrase by phrase or word by word, mix them up, and paper clip them together. Clip each sentence separately and place in a bag. You'll want to prepare a bag for each group. 1. Put students in groups of 2-4. Students will need a larger space to work since they will be putting multiple sentence strips together. 2. Pass a bag to each group. Instruct students to take out one clipped set at a time. Their goal is to put each sentence back in the correct order, working on one sentence at a time. Students should raise their hand when they have all sentences in the correct order. Type and make copies of the vocabulary list that you will be working on. 1. Put students in partner groups of two and give each student a vocabulary list. 2. One student will have a marker and the word list. The other student can access the list, but will not use the marker. 3. The student with the marker will start the timer (select a time appropriate for your grade level and word length) then read a word from the list to their partner. 4. The partner will then have to use that word correctly in a sentence/give the definition of that word (whichever you prefer or you can give both options) orally. When one word has been used correctly, the partner with the marker will check it off the list and read the next word to their partner. This should continue until the timer stops. 5. Students will swap roles and repeat steps 3-4. 6. Students get one point for each check. After both students have had a turn, they will count up the checks on their lists and compare their totals. One last suggestion: review, review, review! Throw in an old word, put a math word in during a science review, and build their vocabulary by allowing lots of practice with words old and new! Thanks for the great ideas. 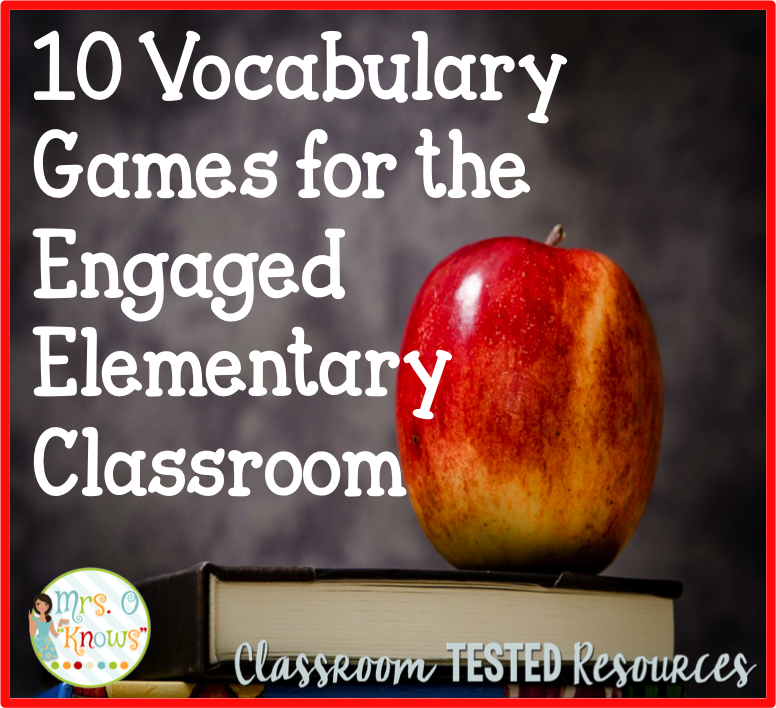 I have a grant for vocabulary development this year and I will definitely be using them.